Decatur Church is a warm, loving, family-friendly congregation who seeks to embrace anyone who walks through its doors. In fact, our vision is "Expanding the kingdom of God, impacting lives, and lovingly embracing everyone". So, whether you regularly attend a church or have never stepped foot in one in your life, you belong here. We welcome and embrace people of all races, ages, genders, and religious backgrounds.  The Decatur Seventh-day Adventist Church seeks to bring healing to the hurting. We are committed to the pursuit of our vision through Evangelism, Christian Education, Multi-Generational Ministry and Service to the Community. At our church, you can expect to: engage in uplifting worship, hear powerful, Biblical preaching, experience dynamic fellowship, and participate in selfless service. We hope you get a glimpse of the grace and hope of Jesus Christ as you navigate our website.